Gail Howard claims 106 lottery jackpots for her wheeling systems. Using ‘Balanced Wheels’ that are a breakthrough for lottery players. I’m going to try and avoid getting into the hype and publicity machine that has been behind the Gail Howard company for many years, and instead focus on the merits of this book alone. It is important to note however that wheeling does NOT increase the chances of winning a jackpot. 50 wheeled tickets has exactly the same chance of hitting a jackpot as 50 quick picks! That’s a fact backed up by real maths professors with proper Ph.D.’s and specialist research in this specific area. There is some merit to wheeling however, but it’s in the winning of smaller prizes more often while you cross your fingers for a bigger one. The number of jackpot winners Howard claims is actually proof that wheeling does not improve odds of hitting a jackpot. Otherwise why are there only 106 winners in 29 years of selling Gail’s systems? What happened to the other 99.9% of people who bought the book and played every week? So we have a book about wheeling. And in ‘How To Wheel a Fortune’ Gail starts off pretty well. The first few chapters cover generally what wheeling is and how lottery odds work. Things get a little fuzzy around why abbreviated systems are better (or ‘Balanced Wheels’ as Gail trademarks them). Yes, they cost a lot less, because they eliminate ‘expensive combinations’ while still giving a ‘guaranteed minimum win assurance’ – but clearly you lose something by dropping all those ‘expensive’ combinations. This isn’t explained. Abbreviated wheels trade the ‘guarantee’ of a jackpot for a ‘guarantee’ of a lesser prize. That’s what you lose. Of course, we need to remember what ‘guarantee’ really means in wheeling terms. Win guarantees always come with an ‘if’. For example, “win at least a Match 4 prize IF 6 of the numbers drawn are in your pool of 10 numbers”. That’s not a bad thing. But it’s nearly always misunderstood, and is the reason lottery wheels are so often ‘mis-sold’. Things really go off the rails though when Gail starts to advise on how to pick numbers. For example, the ‘Balanced Game’ is where Gail attempts to educate us about sums (the total of the numbers drawn when added together) and how it’s far more likely that the results will add up to e.g. 150 for a 6 from 49 game. So clearly we should make our numbers add up to the most likely range of sums. The observation is true. But also entirely useless. Do you know any lottery game that pays out any prize for matching the sum of the numbers drawn..? This entire theory is completely false, yet it has persisted in Gail’s book since the first edition back in 1988. Ignoring the rest of the incorrect information about picking numbers we come to the actual wheels. And there’s a fairly good range here. You have win guarantees ranging from a win 3, 4, 5 and 6, for a wide pool of chosen numbers. There are also what Gail calls ‘Power Number Wheels’ (i.e. key number wheels), but I’m not sure I see the point of these. They let you cover a wider range of numbers, but only if you are positive one particular number will come out. That number then appears in every combination of the wheel. So they are really just abbreviated systems with gaping holes in them. But the main problem with Gail’s abbreviated wheels is that you can do better. The world has moved on since Gail began selling wheeling systems on TV shopping channels. Mathematicians such as Iliya Bluskov have produced wheels with the same win guarantees that cost less to play. That could be as little as 2 less tickets for a small wheeling system, or it could be as many as 50 or 60 less tickets on larger wheels. There are serious faults with this book. Despite being the latest edition, the wheels themselves are dated and you can get better elsewhere. Yet this is the key reason for, and the majority of the content of the book. The advice about picking numbers on the other hand is highly misleading and simply wrong. This is unacceptable from a publisher who claims to be an authority in their field with 29 years experience. 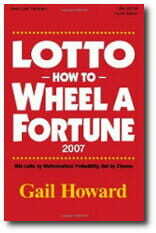 Please share your comments or reviews of Gail’s ‘Wheel a Fortune’ book below. Thanks. This is UNBELIEVABLE. People still fall for this stuff in 2015. Surely, it’s the bludgers and the lazy ones who go for this crap. I had my aunt spend thousands to get this to work on windows 8 64Bit with no luck. Must mention she is cared facility for people who have nothing. You can guess why! Gail Howard I’ll tell you a better name that fits the bill for her as well, FAIL COWARD. The support assholes wanted me to run it in DOS Shell (20+ years old version before Microsoft made windows). I feel this system is good it mixes up the numbers for you but it does not tell you how to get the power single number, so if you have a better system share it. Yes the more numbers you play the more expensive it is, also the more chances you have to win. Wheeling is not really about mixing up the numbers, it’s about creating carefully designed systems with specific win guarantees. And then choosing the right one for the game and budget. The Gail Howard company wheels are OK, just not the best (see Bluskov). But as I say in the review, the real problem with this book is the highly inaccurate advice given on picking numbers.